High Nitrate Presence Short List/Equation: Too much source, not enough uses, limiting factors. I am using a different message because the topic is different. I need your opinion on this: I have 2 Salifert nitrate tests produced in the same time , they will expire on 2015. They both indicate a bit less than 25 ppm of nitrates on my tank. I have lots of SPS, growing, I run biopellets, have a sump full of liverock , the famous basement refugium with 18 cm of DSB and Chaetomorpha that we were talking about ( 3 weeks old though ) and a skimmer rated for twice the volume of water that I employ ( AquaMedic ACone 3.0 ) . So a friend sent me the new Seachem nitrite/nitrate test, brand new. I do the test and surprise: less than 2 ppm of nitrates. This particular test has a reference solution so I used it with the Salifert test: another surprise: even though the test solution was supposed to have 10 ppm of nitrates and was unopened so no evaporation or air contact the same test that said that my tank has 25 ppm nitrates indicated 2 ppm on this one. So I used again this test solution but this time to test the Seachem test, and it showed 10 ppm as it should. On the other side, I attached a photo of one of my Acroporid that shows some signs of very slow tissue lost. Can this be connected to nitrate concentration. 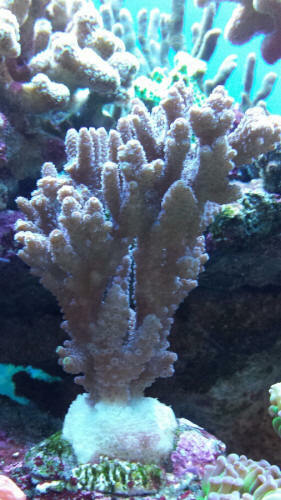 The same Acropora shows signs of growing and polyp extension. I know, I can go for months without questions ( I do try to figured things out myself!) but some questions are so simple they can't be found! Is it possible to determine that ones tank has cycled WITHOUT a nitrate/nitrite test? I ask this because my ammonia WAS at 0.25 for 2 days, and is now barely detectible. I say "barely" because I'm using the API test for ammonia and it is very difficult to read! My brand new 75g. system was set up on May 15th. I've been monitoring the water parameters and tweaking. Is dosing NOT a good practice during cycling? Very helpful and sounds like a great plan. I'll get the live rock ordered next week and start the swap out process once everything is cured. I'm looking forward to the new adventure. I checked the test kit (API brand) and it's NO3. So, you're not terribly worried about NO3 in the range of 80? Am I over-worrying about this amount of nitrate at this point given what we'll change up (removing the bio-bale and bio-balls and adding the live rock) going forward? Several folks have said that API test kits aren't very sensitive and I should just spend the dough on something more accurate like Salifert. Looks like this may be a fairly accurate nitrate analytical comparator test kit and it looks like they will be etailing for about 35 bucks.